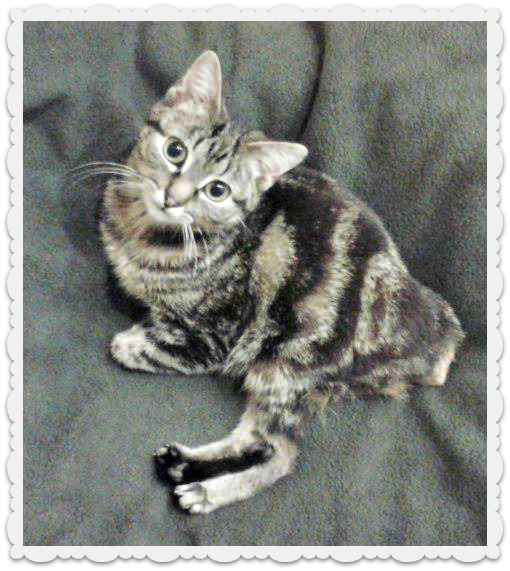 In the spotlight today is "Dot", a kitten who was born with a condition called Spina Bifida. This disease is a rare birth defect. In the womb, the vertebral arch does not fuse normally. Since she has Spina Bifida, Dot is not able to use her back legs. This does not stop her from getting around though! She is still able to move around using her front legs and very quickly at that! She is able to climb up a 7 foot cat tree lightning fast! You can watch the video below. Dot cannot express her bladder or bowels on her own, and needs a little help from her human friends at Tabby's Place in New Jersey where she now lives. She was born in a garage in Virginia a little over a year ago. 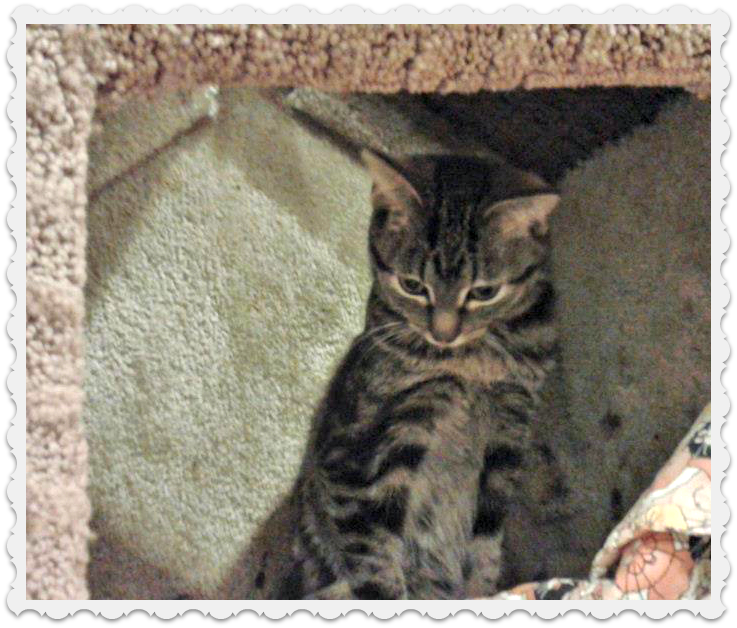 Dot is a sweet little kitten who loves to cuddle. Her favorite color is blue and she loves to play with her toys. She is named Dot because she has a dot where many other kitties have tails. She has her own Facebook fan page with more than 2,000 friends! In many of her cute videos, she can be seen playing with one of her good kitty friends, D'art, who is a paraplegic cat that was thought to have been hit by a car at a young age.You can become friends with Dot on her Facebook page here. She has plenty of super cute videos to watch there! 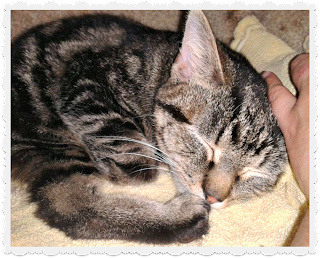 Tabby's Place provides Dot with important physical therapy, proper nutritional support, love, care, and pays for her costly medical bills. 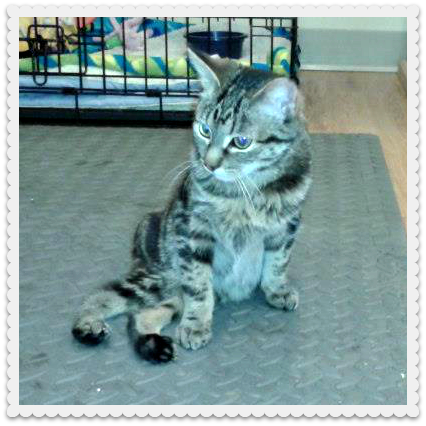 Dot's condition requires lots of medical attention, including check-ups at the vet and MRI's. If you are interested in donating to Dot, please visit her donation page here. Tabby's Place is a wonderful Cat Sanctuary where cats in unfortunate situations can go to seek refuge. They rescue cats in need, many of which would have been euthanized otherwise. They rescue normal kitties as well. Tabby's place is an adoption center, hospital, and hospice all in one. They care for a lot of elderly, handicapped, and chronically or terminally ill cats who have no where else to go. The cats at Tabby's Place can enjoy living and playing with other felines. They have lots of toys, scratching posts, and towers to play with. They also get to play outside sometimes in special outdoor enclosures. Tabby's Place also has a medical facility on site. Basically, this place is special needs kitty heaven! If you want to learn more about Tabby's Place or donate to their cause, please visit their website here! Amazing what can be done these days. Great post. Have a super Sunday. It looks like such an amazing place for kitties! On the videos on Dot's Facebook page, the sanctuary looks like such a wonderful place for a kitty to live. Thanks for reading.